The NAPLEX®, or North American Pharmacist Licensure Examination®, measures a candidate’s knowledge of the practice of pharmacy. It is just one component of the licensure process and is used by the boards of pharmacy as part of their assessment of a candidate’s competence to practice as a pharmacist. Be sure to download the Application Bulletin only from this website to get the most accurate, updated information about the NAPLEX. NABP is aware of some websites that are posting fake, outdated, or incorrect application bulletins. Please note: Effective February 4, 2019, there will be changes to the eligibility and resit request policies. These updates will be reflected in the new Bulletin that will be published in the first week of February 2019. Click here for more details on the policy changes. Ready to take the test? To start the two-step process, log into your NABP e-Profile. It is during this step that the board of pharmacy in the state for which you are seeking licensure will determine your eligibility to take the NAPLEX. They review the information you provided in your e-Profile and your application. Before you apply, check with your board of pharmacy to make sure you meet their requirements. When you submit your application to NABP you will pay a $100 non-refundable application fee. There is an additional $85 non-refundable fee for candidates who select Colorado, Maine, Michigan, Nebraska, Oregon, and/or Utah as their primary state of eligibility as NABP confirms eligibility to test for those jurisdictions. Once the board determines that you are eligible, you will receive an email instructing you to purchase the exam. When you are ready to purchase the exam so that you can schedule it at the test center, log in to your NABP e-Profile again. Go to Exam Services to purchase your exam and pay the appropriate fee. If you plan to seek licensure in multiple states, utilize the Score Transfer option. Don’t forget! The name in your e-Profile must match the printed name on both the primary and secondary forms of ID that you will bring to the test center. If the name in your e-Profile does not match your IDs, you will be turned away on the day of the test. See the Important Test Day Information section below or the NAPLEX/MPJE Application Bulletin for more information. NABP offers discounts for members of the armed forces and their spouses. Active members, reserves, and veterans of the armed forces will receive a 100% discount on the NAPLEX application and examination fees, and their spouses will receive a 50% discount on the fees. Fees for repeat attempts and resitting fees will not be reimbursed. All submissions are made via your e-Profile, not through email correspondence. You must apply for the discount prior to purchasing the approved services. For more details on obtaining an armed forces discount, see the FAQ section. If you need test-day accommodations under the Americans with Disabilities Act, instructions and a link to the form can be found in the Bulletin. The form is also available for download in the online application. If you select Colorado, Florida, Maine, Michigan, Nebraska, Oregon, or Utah for your primary jurisdiction, you will need to upload the forms during the application process. Once your board of pharmacy determines your eligibility to take the examination and NABP is notified, Pearson VUE (NABP’s testing vendor) will send you an Authorization to Test (ATT). The ATT includes the dates during which you are eligible to take the examination as well as an authorization number. You may use that ATT to schedule your examination with Pearson VUE. Please note that you cannot schedule your exam unless you have an ATT. When your ATT arrives, make sure that the name printed on it matches your primary and secondary forms of ID. If they do not match, you will not be admitted into the testing center. Your name will be printed on your ATT exactly as it appears in your NABP e-Profile. Please see the NAPLEX/MPJE Application Bulletin for more information. The statements can be found in the NAPLEX/MPJE Application Bulletin. To get a feel for what is on the exam, consider taking the Pre-NAPLEX. The Pre-NAPLEX simulates the NAPLEX testing experience as you field questions similar to those you will face on the day of the test. Available online, the Pre-NAPLEX is accessible anywhere you have an internet connection. The printed name on both your primary and secondary forms of ID must match the name that appears on your ATT letter. 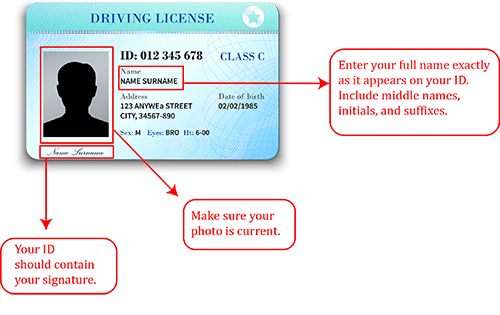 If you do not have the correct IDs with you on the day of your test, you will not be able to test. Your name will be printed on your ATT exactly as it appears in your NABP e-Profile. See the NAPLEX/MPJE Application Bulletin for more information. Arrive 30 minutes early: This will give you time to complete check-in procedures. You may be required to forfeit your appointment if you do not allow enough time. Read the NAPLEX/MPJE Application Bulletin for more information about procedures and restrictions. View NABP’s Tips for Examination Preparation in a new tab. Start your pharmacy career off on the right foot and follow all examination rules. If you have witnessed such misconduct or other irregularities as described in the Bulletin, please report it to NABP immediately. The video below provides an overview of the consequences of exam misconduct. Please read the NAPLEX/MPJE Application Bulletin for detailed information about exam misconduct. View NABP Exam Misconduct: What Happens if You Break the Rules? in a new tab. The NAPLEX/MPJE Application Bulletin contains detailed information on what to do if you miss your examination appointment and how to reschedule an appointment. Please note that you will be charged fees for rescheduling and missed appointments. Our eligibility and resit request policies have been updated and will be reflected in the new Bulletin that will be published in the first week of February 2019. Read more about the policy updates here. You are allowed a maximum of 5 attempts to pass the NAPLEX. After a failed attempt, you must wait 45 days to next attempt the NAPLEX. Some exceptions may apply, as NABP member boards retain the authority to determine the number of attempts per candidate in their jurisdiction. Contact NABP Customer Service for more information. Effective February 4, 2019, if your eligibility for the NAPLEX or MPJE is within 10 business days of expiring you will be unable to purchase the examination. If your eligibility period is 10 business days or fewer you will need to submit a new application and the board will need to enter new eligibility dates for you. When your eligibility period is set to expire within 10 business days it can be extremely difficult to purchase an exam and to schedule an appointment to test before the eligibility period expires. We encourage you to purchase your examinations as soon as you are granted eligibility and to schedule an appointment to test as soon as you receive your Authorization to Test (ATT) letter to ensure that your requested appointment time can be accommodated. Effective February 4, 2019, the resit fees for NAPLEX and MPJE candidates will be changed to $475 and $150, respectively. If you missed your scheduled examination due to an emergency, you may be able to purchase a resit at a reduced fee ($170 for the NAPLEX and $100 for the MPJE). You will need to submit a Resit Request Form and supporting documentation within three business days of your missed appointment to qualify for the reduced fee. Emergency situations will be evaluated on a case-by-case basis to determine what, if any, fees would be changed. Resit fees apply when you miss your scheduled testing appointment without following the proper cancellation procedures; this includes when you are turned away at the testing center for having improper identification and arriving late for your scheduled appointment. If you miss your appointment your ATT will no longer be valid, therefore, you must purchase a resit to get a new ATT to schedule a new testing appointment. If your eligibility for the NAPLEX or MPJE is within 10 business days of expiring you will be unable to purchase a resit. Details on how you can submit claims for a reduced resit fee, including forms, required documentation, and submission deadlines will be provided in the new NAPLEX/MPJE Application Bulletin when it is published in the first week of February 2019. We encouraged you to review the Bulletin prior to requesting a resit to ensure that you have the most current procedures.